Guitar legend Carlos Santana was reunited with drummer Marcus Malone after finding out he was homeless for 40 years. The heart warming tale of friendship, hard life and ultimately love of music started with a local news piece about illegal dumping in east Oakland. 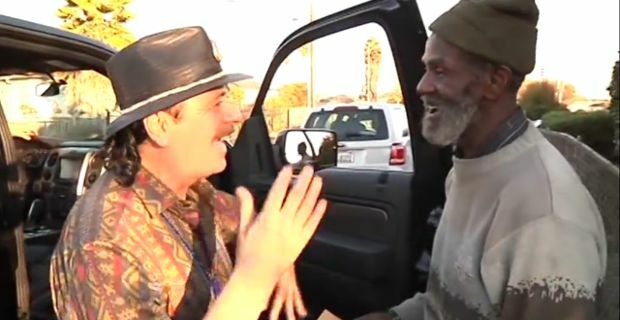 Marcus "The Magnificent" Malone, once a valued member of the original Santana band, was just another homeless man featuring in KRON 4's "People Behaving Badly" two weeks ago. Until he happened to mention that he played the drums in the original Santana Blues Band when the band started off in the 1960s. Turns out that Malone performed as a member of the Santana Blues Band up until 1968 when he was convicted of a manslaughter and sent to San Quentin Prison. An unlucky timing, since the following year Santana and his band performed at the first Woodstock music festival alongside the likes of The Who, Jimi Hendrix and the Grateful Dead. After that, the old friends lost track of each others. KRON 4 reporter Stanley Roberts, who interviewed Malone alongside the other homeless, was originally skeptical of the man's claims. But he checked out the whole story and was able to confirmed it, so he went and got Santana for a surprise visit to Malone's camper last Friday. When Santana and Malone were finally reunited they told Roberts they had not seen each other in over 40 years. But Santano had not forgotten about him. In the book "Not Fade Away: A Backstage Ticket to 20 years of Rock & Roll" written by Ben Fong-Torres, Santana has credited Malone with being an important influence on his Afro-Latin sound. When the two met, for the first time since 1968, Malone almost whispered to the guitar legend: "You don't know how afraid I am to let you see me." "We cherish you," was how Santana replied, before adding "It's an honour to be in your presence." It is reported that Santana promised to bring Malone a set of congas and to help him get his own life back. And with the new year, Santana and other former members of the Blues Band are planning to take Malone back in the studio to do what he can do best, playing the drums.